I actually get choked up when I look at this picture and think on it. 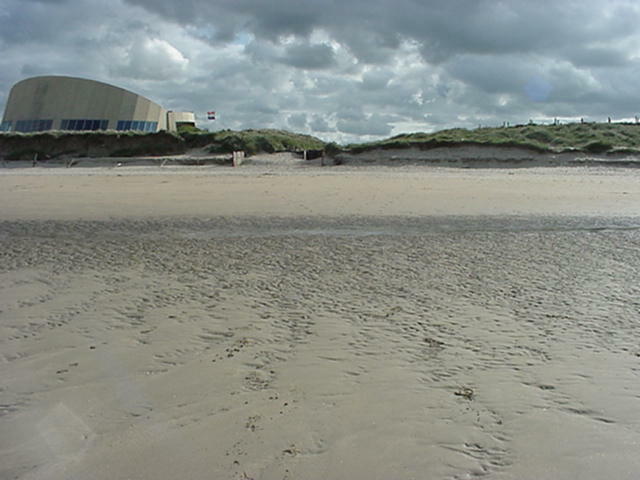 I took it at low tide, at Utah Beach, Normandy, France back in the early 2000s. Some of you WWII historians might be able to correct me on some details, but the intent of the military planners of Operation OVERLORD was to hit the beaches at high tide. The Germans expected that, of course, so that’s why there were all the obstacles you see in the movies …the iron triangles and such, many of which were rigged with explosives. They were there to impede ingressing amphibious craft, which would find them difficult to detect when they were submerged under the water. So why would you want to hit the beach at high tide? Because otherwise your soldiers, marines, and sailors had this to look forward to: a long stretch of open, wet sand to cross on foot while the Nazis laid down withering machine gun fire, grenades, mines, etc from entrenched positions. Due to some delays, Allied Forces missed high tide, and had to hit the beaches at low tide. So one day in late May, only a week or so removed from the anniversary date, I found myself in Normandy, France. I walked out at low tide, turned, and tried to imagine jumping off of my Higgins boat, and then racing toward the hardened defenses of Normandy. Take a look and imagine. It was a humbling experience. God bless those men. A few weeks ago, I published an article that looked at the logistical constraints faced by the Crusader armies and the Muslim Sultanate during the Third Crusade. It was while researching this that I became fascinated with the subject of ancient and medieval naval power. Lacking all but the most rudimentary navigation and communication capabilities, the navies of ancient and medieval kingdoms nevertheless were capable of incredible military feats and breathtaking displays of power and brutality. With naval forces of the ancient world largely littoral in nature, there were some similarities between naval strategy and tactics with those of ground forces. However, the unique requirements and capabilities of naval power were appreciated as well. Naval forces were far more expensive and required a certain level of specialized training to be effective. As with land warfare, coordination of efforts between large numbers of forces was critical, and that would seem to be even more so for naval vessels spread out across a wide sea. The Greek Trireme dominated naval warfare for centuries in the central Mediterranean. confront the Persians close to Salamis. The Greeks took advantage the narrow sea lanes formed by the straits at Salamis to draw the Persian forces into a choke point that deprived them effective use of their superior numbers. For the Athenians, there was both a combat advantage to battling close to the island, as well as command and control consideration (fighting closer to the isthmus would potentially tempt some of the non-Athenian Greeks to flee so they could defend their home cities). Plus, there were additional considerations that needed to be addressed, such as access to land and allies for the crew if a vessel sank. Polybius’ description of fleet formations in The Histories some 200 years later during the First Punic War were also incredibly detailed, and indicated significant communication and training requirements. He painted an impressive picture of the battle, from the “six-banked galleys” of the Roman commanders, to the increasing spacing between the following vessels to form a wedge. He included the number of vessels, how they were arrayed, and the effects of the nearby terrain and open ocean on tactics and strategy. As one seeks to understand Carthaginian or Persian tactical decisions and strategic objectives, however, additional sources from those sides would be much more valuable. Not too many historians would likely ascribe Xerxes’ decision to face off with the Greek navy at Salamis to the prophecies of ancient oracles. So why then did he? If Herodotus’ writing somehow accurately captured the words of warning from Artemisia, did Xerxes truly believe his presence alone would carry his forces to victory? The play The Persians, written by Aeschylus, has something to offer in aiding our understanding of the events that took place at Salamis (“how hateful is thy name!”). Like all primary sources, this play does provide the identification of men and women, their placement in relation to the events of the battle, and the types of weapons and the outcomes of battles. But as when Polybius and Herodotus get into the minds of the enemy, with no clear idea of the sources used to do so, once should question the veracity. The Eastern Mediterranean seemed to be uniquely shaped to encourage the development of naval warfare. The comparatively calm, land-encircled Mediterranean Sea, rich in natural harbors and clear sea lanes proved to be an ideal laboratory to develop naval warfare. Although naval capabilities, particularly in ship-design and navigation, had advanced significantly since the days of the Romans, naval warfare was still mostly littoral during this period, and usually directly associated with land warfare. Weather, that spoiler of the best laid plans of ground commanders, had an even greater impact on naval operations. The weather and tides in the Mediterranean Sea were somewhat predictable and more advantageous in some respects to European powers than to Arab and Muslim powers on the south coast. Yet, with that said, weather could and did surprise medieval navies. The account King Richard’s conquest of Cyprus even begins with weather woes: “Richard’s ships had been dispersed by the uneven winds and were making for Cyprus.” As they did so, a number of ships were wrecked on the coastline because of this weather. particularly true for soldiers simply being ferried to an expected land war (as the Crusaders were) who were not experienced with sailing. When Richard landed at Cyprus, his forces were reduced because many of his troops “were exceedingly fatigued from the continual tossing of the sea.” This degradation was not confined to just the soldiers, however. When Richard’s army pursed the fleeing Emperor of Cyprus, they were conscious of the fact that the horses had been “tossed about at sea for a month,” and therefore did not drive the beasts hard. In regards to actual sea combat, the accounts of medieval naval battles captured the brutality of this warfare. Writing of the Battle of Sluys in 1340, John Froissart observed “Combats at sea are more destructive and obstinate than upon land, for it is not possible to retreat or flee – every one must abide his fortune and exert his prowess and valour.” And though Salimbene de Adam, in writing of the naval battle between Pison and Geona in 1147, did not make direct comparisons to land warfare, the particular manner of combat he describes makes it clear that combatants either fought or died: “[T]hey tied their ships together in the usual fashion of a naval battle. And there was such great slaughter on both sides at that place that the heavens appeared to weep in sympathy.” Even taking into account expected hyperbole, Frossart’s observation that one had nowhere to run away to during a naval battle makes the likelihood of excessive casualties, compared to land warfare, quite plausible. Stephen Morillo, Jeremy Black, and Paul Lococo, War in World History Society, Technology. And War from Ancient Times to the Present, vol. 1, To 1500 (New York: McGraw Hill, 2009) 78-79. Stephen Morillo, Jeremy Black, and Paul Lococo, War in World History Society, Technology. And War from Ancient Times to the Present, vol. 1, To 1500 (New York: McGraw Hill, 2009) 279. The Chronicles of Sir John Froissart, Chapter L, The naval engagement between the king of England and the French before Sluys, Ref: http://www.maisonstclaire.org/resources/chronicles/froissart/book_1/ch_026-050/fc_b1_chap050.html.